In building your dream home, one of the things you should allot time and effortfor is the dining area. It is where you get to meet your family and friends to eat together, and as the meal progressed on, it is where you share each other’s stories and catch up with one another’s lives. Aside from it being a crucial portion of the home, several people are truly attached to the art of cooking. Creating masterpieces through food and edible art is spectacular. If you are a fan of this hobby, then one of the things you put the focus on is the collecting dinnerware and kitchenware. What else can be more satisfying than to see your family contented on a meal you cooked or over a dish you bought on your way home? Food has been one of everyone’s favorite, and since we are treating ourselves to eat healthy, delicious meals, high quality dinnerware is a must to invest in building one’s home. We have also written a complete guide about best stainless steel cutlery sets. In creating a good table setting, you must invest in good quality dinnerware. You wanted to spice up every meal that you share with your loved ones on the table, and purchasing adorable, safe and good quality plates and complements would be one way to show your interest on home improvement and guest’s satisfaction. Why do you need to buy good plates and platters? It is because your dinnerware affects the overall appeal of your dining experience. If you want to enjoy your meal, then a neat, decent and delightful plate adds to your appetite level positively. Imagine a filthy, old and chipped plate to dine on. That would be an unpleasing experience, right? Purchasing a new set of dinnerware can be fun, but you can’t shop immediately without any insights about dinnerware. Here are some of the helpful information that will help your purchase count as a bang-for-the-buck, worthy buy. We have also written a complete guide about best bakeware sets. Stoneware is a tough and durable material to be used as a material for plates. Plates made from stoneware are thicker and more opaque, and they can be polished with shiny, satin or matte textures. Usually, earthenware is more affordable than other materials. Earthenware plates undergo firing and glazing. This type of material is decorated with hand paintings. They are not as durable as others as they are prone to chipping. The problem with earthenware based plates is that they can absorb liquid, so avoid leaving them submerged in liquid due to theprobability of staining. Dinnerware created from this material are made of fine-particle clay that is fired over high temperature. This exposure and process establish the extremely durable and nonporous quality of the plate. Due to the procedure underwent, the plate becomes thinner. These plates are typically dishwasher, microwave,and oven safe. Plates based on bone china are made from bone ash that is mixed with clay and fired at alower temperature than porcelain to create a very lightweight, delicate and translucent texture. Despite the frail impression of these plates, they are in fact the most robust and durable dinnerware. Fired at asuper high temperature to produce nonporous and exceptionally durable plates, vitrified glass is tagged as the indestructible plate material of all time. This is safe for microwave and dishwasher use. They are the best options if you are to eat outdoors or feed kids. Another indestructible material to create plates, melamine is a plastic material that is lightweight but rigid and inflexible. They are typically dishwasher safe, but not viable for microwave or oven use. Slightly curved edges with no indentation. It measures between four to seven inches. Round in shape and measures seven to eight and a half inches. Wide, shallow bowl that has an inch rim and measures nine to ten inches in diameter. This plate typically measures 10 to 12 inches in diameter which is used for the main course. Plates that are around seven to nine inches and are usually decorated with patterns and prints. This is the partner of a teacup. It is usually less than 10 inches in diameter with anindentation for the corresponding cup it matches. Now that you know the basic information you must learn before purchasing a new dinnerware set, then let’s begin the prime list! Mikasatruly brings the most outstanding dinnerware to the shoppers with this state of the art, fabulous set that will spice up your dining table. The soft, delicate decors of hearts and curves alongside the porcelain utensils create a glamorous, elegant vibe to your dining experience. 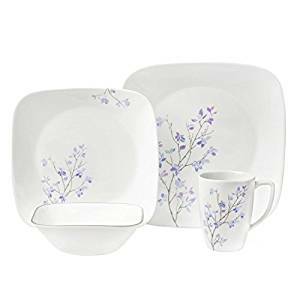 Not only does this set is angelic and beautiful, it’s simple yet lovely designs will surely make you want to treasure this priceless dinnerware set! This charming dinnerware is available in white with platinum banding and decors on the porcelain’s sides. The material used for this precise, excellent dinnerware is the best quality of porcelain. Most opulent dinnerware is made of this raw material, as it assures durability, safety as well as compatibility for most use and functions. All of the dinnerware in the set are dishwasher safe and are suitable for candlelight dinners as well as for casual occasions with family and friends. This dinnerware set is a complete package, putting everything you need in one purchase for you to save shopping and shipping time. It can be availed in a 40-Piece Set which includes eight of each of the following–10 and ¾ inch dinner plate, 8 and ½ inch salad plate, 7-inch bread and butter plate, 6-inch saucer and 9-ounce teacup. One of the things to love about this set is that it can be purchased in a 5-Piece or a 20-Piece set as well, depending on the quantity you want to add to your current collection. The top of the line dinnerware brought to us by Mikasa not only astounds users based on its beautiful and graceful branding, but rather on its functionality and use. 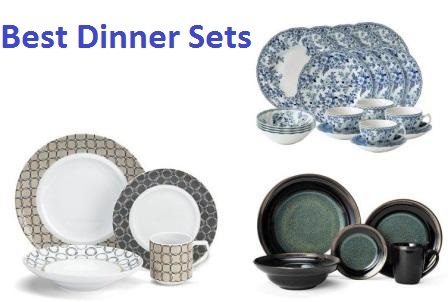 One of the features to love about this excellent set is the cohesive collection and completion of almost all the basic dinnerware used during dinner celebrations. Also, the quality of the product is guaranteed and it’s easy to care and maintain characteristic does not disappoint the customers. Truly, this is the best dinnerware set out on the market! Mikasa is one of the most complimented manufacturers in the industry of dinnerware production. Customers have praised how their products are delivered complete and in good condition. They are also similar to the photo ads, which makes the purchasers happy of their choice. They can be both bought for personal and gift purposes. The stunning dinnerware set is perfect for all occasions, and truly it deserved the top spot on the list for its affordability, durability, lovely design and complete set. The only problem for this set is that they are not microwave friendly, so avoid using them when reheating meals. If you are searching for pretty platters to match your minimalist preferences, then this dinnerware set is definitely for you! Introducing another great set of dinnerware is Corelle’s 76-Piece dinnerware set that can accommodate 12 persons. Each element of the set is decorated with dots and circular outlines on the edges. Aside from the beautiful, complimentary match of bold, geometric prints of black and white, the plates are attractive and appealing to look at. 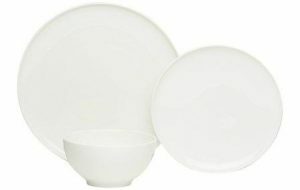 The only color available for this dinnerware set is white with black décor. Corelle’s dinnerware set is made of a three-layer glass that has undergone keen processing and creation to ensure that each piece from the set is strong and non-porous despite its thin and lightweight features. Also, due to the maximization of resources, this dinnerware set is made of the best quality materials for customer satisfaction and enjoyment. One of the things to love about Corella’s dinnerware set is that it accommodates a large group with its 76-Piece choice for interested customers. The hefty package includes twelve of each of the following—10 and ¼ inch dinner plates, 8 and ½ inch salad/luncheon plates, 6 and ¾ inch bread and butter plates, 18-ounce soup/cereal bowls, 15 ounce rimmed soup/salad bowls, and 10-ounce dessert bowls. Also, the set has two of each of 12 and ¼ inch platters and 1 qt. serving bowls. This set is also available for 16-Piece and 20-Piece variants if users have a smaller family to share. This dinnerware set is break and chip resistant, so there is no need to worry about breakage and tear. This minimizes the risk of wear and tear as years of usage fly by. Also, the set features lightweight and thin pieces which can save up space and room for more utensils to keep. Most of the other dinnerware cannot be used to reheat foods in the microwave, but Corella’s set is safe for oven use. This easy to clean and keep dinnerware will surely make every customer happy and contented with their great deal. As promised, this set provides for its primary functions and meets the descriptions accordingly. Customers are happy about their composition and quality, although several ones are a little disappointed to mistake it as literally made of glass. Some customers did not appreciate the prints and thought of the material as thin, but that is clearly indicated in the ads. Overall, everything is great and the customers get what they paid for the price. One of the most modern and sophisticated designs featured in the list is Cuisinart’s 16-Piece dinnerware set. The thing to love about this eye candy set is the adorable prints on the end of the platters, as well as the matching design all over the mug that comes with the package. It fits most of the new age styled homes, and it brings added spice to your dining table during the meals shared with family and friends. This is available in ample of variants of styles ranging from Aleria to Tile, which can be found through online shopping. Made from ceramic stoneware designed with vibrant colors and prints, this dinnerware set boasts its prime material and gorgeous styles to its market. Among other dinnerware sets in the list, Cuisinart works hard to meet customer’s demands while it continually innovates for the betterment of its product. Alongside quality comes the beauty of the ceramic attributed to its plenty of design choices and variants. This dinnerware set is composed of a 16-Piece ceramic package that includes four dinner plates, four salad plates, four bowls and four mugs. It is perfect for middle-sized families or group of friends to enjoy a delicious meal over additional beauty to the dining table. This set is one of the best-selling dinnerware in the market for its functionality and avast range of print choices. You will be inclined to collect the wonderful patterns available from this manufacturer. The ceramic material really helps to bring life to a dull table, and its bright, beautiful colors and prints will truly add appeal to your group meal. There is no need to worry about the dishwashing and reheating of food as this set is dishwasher and microwave free. Customers are pleased to receive and use their new dinnerware brought by Cuisinart. The gorgeous designs and prints live up to the customers’ expectations, and the functionality of the product is on thecheck. The only issues that come along the set are that the packaging may still be improved as there are some reported claims of the ceramics breaking even before reaching the customers’ hands. Also, the microwave friendly feature should not be abused if users wanted their dinnerware to last longer. Another product from Corelle is the 74-Piece dinnerware set with storage lids. Corelle is starting to tag along with its label the minimalist techniques of their plates and platters, and it totally works to almost all the customers searching for their perfect dinnerware. The dots matched with circular designs at the edge of each piece was back, but this time there’s more! Additional prints are available for everyone to love. The available prints and colors for this dinnerware set are city block, classic café blue, crimson trellis, sand sketch and winter frost white. Vitrelle glass is used to create this spectacular set of dinnerware, and Corelle works hard to ensure that their products are of atop shape and lasting quality. The mugs are made of durable stoneware material which works for better insulation and drinking experience. The material used for the platters results in a lightweight and thin finished product, but it ensures quality and durability as time passes by. This set is composed of 74 pieces which includes 12 pieces of 10.25 inch dinner plates, 12 pieces of 8.5 inch luncheon plates, 12 pieces of 6.75 inch dessert plates, 12 pieces of 18 ounce soup/cereal bowls, 12 pieces of 10 ounce dessert bowls, 2 pieces of 1 qtserving bowls, two pieces of 2 qt serving bowls, two pieces of serving platters, six lids for 18 ounce soup/cereal bowls and two lids for 1 qt serving bowls. The bonus features for this set will be the storage lids. The added utility this brings are useful, as it saves time and money to use or purchase Tupperware in order to keep food in another container. Also, the patterns on each piece of the dinnerware do not wash, wear or scratch off. The dinnerware is also dishwasher, refrigerator, microwave and pre-heated oven safe for everyone to use. Customers are all smiles upon the arrival of their packages at home. The complete dinnerware adds beauty to their dining experience, and the numerous pieces included in the set helps save time for shopping and coordinating dinnerware at family and friend gatherings. The beautiful prints are adorable as expected. The issues that lie with Corelle’s product will be the room for improvement in their packaging and handling of shipping cargoes. Also, microwave friendly feature does not assure that the product is invulnerable to breakage and tear. One of the most attractive and captivating designs on the list is that of Wedgwood’s renaissance gold 5-piece place setting. The thing most people loved about this dinnerware the most is the combination of color and patterns, creating a refreshing vibe over the table. This set is a must for those who are looking for a modern yet gypsy spin to their dining room showcase. Fine bone china is the material used to create this masterpiece. Bone china is typically made from cow bone, and the process of producing one piece is intricate as well as the painting and décor step. This is one of the most special materials to use for a long-lasting, durable dinnerware. 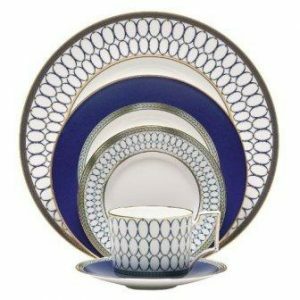 The 5-Piece dinnerware set provided by Wedgwood is composed of a 10.75-inch dinner plate, 8-inch salad plate, 6.89-inch bread and butter plate, 10-ounce teacup and a 6-inch saucer. This collection is beautifully coordinated and linked to each piece, and the paintwork on the fine bone china shows the royal and exquisite taste that the customer can incorporate into a simple dining table. This stunning, ornamental collection of dinnerware does not only shows its neoclassical appeal and beauty to the users but also it commits to its functionality and use well. Aside from the elegance of each piece, the durability and purpose of the collection are highly justified. The plates are not too thin and are dishwashing safe. The gold banding along the sides of each piece adds grandeur to the overall appeal of the collection. Customers cannot enumerate in one sitting all the good things to love about this great purchase. The pieces in the collection are simply breathtaking and pretty as promised. The renaissance designs to choose from will simply want you to buy the entire selection, and the good size and durability of the product are awesome! This is a true example that beauty and use can be fused in one package. The only issue that this set may face would be their delicate and fragile nature, which the packaging and delivery process have room for improvement. One of the most attractive and impressive designs to love with dinnerware sets is brought to us by Churchill’s quintessential English inspired 20-Piece set of utensils to add to your current dining table. Not only does this set screams beauty, but also the historical roots of England is shown through the awesome art. The story featured on this traditional paintwork is that of two lovers that turned into doves. Painted in careful and precise strokes of blue colors, these magnificent art pieces are definitely a yes! This historical pieces of dinnerware are made of earthenware, an English ironstone that attributes to the durable and sturdy quality of each piece in the collection. Also, Churchill ensures ease of use for their customers, that’s why this collection includes dishwasher and microwave safe pieces that will save you from worries and extra efforts in doing your daily chores at the kitchen. This beautiful set includes 4 dinner plates, 4 side plates, 4 teacups and saucers, and 4 oatmeal bowls. The paintwork on each piece corresponds to the others, and this set is not only available in a 20-Piece package! Churchill offers individual items in case you wanted to purchase a standalone piece for your current collection. 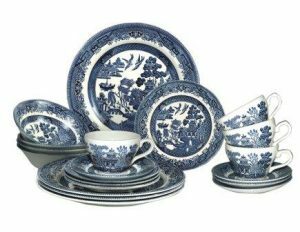 There is no doubt that this dinnerware set exceeds superior with their beautiful prints and design, but what’s more astounding about the set is the good functionality and use experience almost all customers indulge in. This is one the most highly recommended purchase for its aesthetics and purpose. Also, you don’t get to have something that amuses you while you eat your meals. The paintwork on this set is simply superb and fabulous! The supremacy of this set does not only resonates through the ads but as well as to the customers’ satisfied feedback. The success of Churchill is highly commended by happy users due to the durable, expensive feeling and terrific quality of the dinnerware. The design is simply phenomenal, and the customer service system is good. The only thing buyers should watch out is to verify the manufacturer and producer of the products since this brand has succeeded well and a lot of imitations are out on the market. Corelle proves that it is one of the leading manufacturers of the best dinnerware out in the market with this another entry. The square 32-Piece dinnerware set is a refreshing collection that captivates attention from buyers for its modern style and soft patterns. The gentle, lovely strokes create a vision of light, agleeful home that adds appeal to your dining table. Feel homey with these adorable prints available in variants of happy days, jacaranda,and splendor. Another dinnerware set made from Vitrelle glass, Corelle is consistent with using this durable material for all of their dining products. The intricate process of creating each piece of dinnerware is ensured to bring the best quality of materials that are microwave, dishwasher,and oven friendly for your everyday use. Each set of 32-Piece collection from Corelle includes eight of each of the following—10 and ¼ inch dinner plates, 8 and ½ inch luncheon/salad plates, 18-ounce soup/cereal bowls and 12-ounce stoneware mugs. This adorable set comes with a three-year warranty and they are made in the USA. This dinnerware set is said to be one of the most purchased, trusted and recommended brand throughout the world for its excellent quality and great feedback. Aside from the safe and flexible usage on the microwave and dishwasher, the Corelle dinnerware set also promises that the designs will not wash, wear and scratch-off from the pieces. Also, these thin, lightweight and durable set will assure you that you made the right choice for purchasing them among other alternatives. This dinnerware set is one of the best deals you can purchase out there! With the outstanding features they offer for an easier life, they have delivered excellent results to a lot of customers and users. The things to love about this collection are the patterns, the weight, the ease of use and compatibility to appliances, and the durability of the products! The only issue this set may face would be the cups being heavy, but everything else is on point after that! Another product offering from Mikasa is the Regent Bead 40-Piece porcelain dinnerware set for eight people. The simple, minimalist design creates an elegant, sophisticated appeal that most people prefer for their dinnerware sets. This dinnerware set can be used for special gatherings and visits, and it can also be used for normal, everyday dining setting. The color available for this set is regent bead which is a splash of black and white colors. High-quality porcelain is the material used to create this prime dinnerware set brought to us by Mikasa. The shiny platinum banding on the edges of the pieces places emphasis on the regal and elegance of the design, as well as to the supreme appeal it brings to the dining table. Made from the best materials to ensure durability and long-lasting use. Each dinnerware set is composed of eight pieces of each of the following—10 and ½ inch dinner plates, 8-inch salad plates, 8 and ¼ inch rim soup bowls, 6 and ¼ inch saucers and 8-ounce tea cups.Mikasa is also committed to assuring that customers are happy and contended with their purchases, so they regulate the customer service system to assist the issues encountered by their loyal buyers. Mikasa’s 40-Piece regent bead set does not only promises pleasing ads to the public. They commit to providing the top of the line, worthy dinnerware set to their customers. The function and use of this dinnerware set are no doubt, and their added features are simply essential to their buyers. The pieces from the collection are dishwasher safe, but they are not microwave friendly. They are durable, supreme and regal pieces of dinnerware that everyone can use anytime, anywhere. These pieces of porcelain dinnerware are loved by the customers, as well as by the people who received them as gifts. They are best used as everyday dishes as some customers claimed, but several other buyers believed that they are elegant and are fit for fancy occasions. The only issue that this set may encounter is their lack of design and that they are mere “okay.” Mikasa has some room for growth and the customers are excited to spectate their new offerings in the future. There is only one word to fit the description of these dinnerware pieces at first sight—WOW! By merely staring at their appearances, you will definitely love the way they are designed and painted creatively. The blue color compliments the neat, white background of the plates. The lovely vines and flowers that surround the ceramic are simply stunning. This must be the rank one dinnerware set based on aesthetics and first glance basis. Another dinnerware set made of clay called the earthenware, Johnson Brothers creates a supreme, top of the list collection that matches up with the high-quality creations imported from England. This outstanding material is topped with the astonishing print style of Devon Cottage that depicts the life in the countryside. This premium dinnerware is inspired by a day in a picnic, but by the material and construction of each piece, it can also be fit for a grand celebration. The 20-Piece set of elegance and beauty is made up of 4 dinner plates, 4 salad plates, 4 soup bowls, 4 teacups and 4 saucers. Johnson Brothers do not limit the choices for the customers as they offer individual purchases of each dinnerware piece, depending on the need and preference of their prospective buyers. There is no doubt about the capability and functionality of the set. The outstanding material used for its sturdy and great construction attributes for the durable and long lasting quality of each piece in the set. The astonishing and artistic design also adds to the appeal of the entire set. Customers do not have to worry about using the dishwasher and the microwave for future reference as these pieces are both friendly and compatible with the aforementioned appliances. 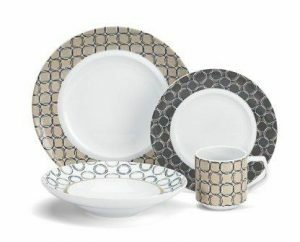 One of the things customers go crazy about this set is the overall print design and beauty of the dinnerware set. The flower work is simply the best among the rest, and the material choice equates to the durability and strength of the piece to last for long years of use. The only issues you need to be wary about is the delicate nature of the pieces. Also, the shipping issues regarding some items arriving broken that several customers faced can still be improved. 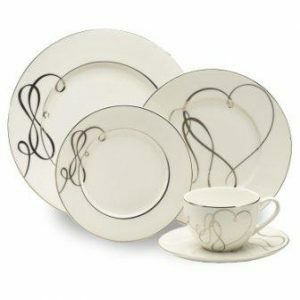 If you are more of the sophisticated, less-is-more type of a buyer, then this dinnerware set may be the one for you! 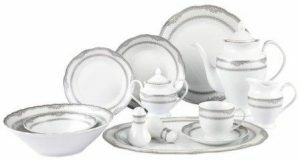 Introducing the Loren Home Trends’ pride, the 57-Piece dinnerware set that can service eight people. The overall design is simple yet fabulous, with the light, basic colors over the white canvas work beautifully together. The play of lines and dots on the edges of each piece looks amazing. There are available color choices namely: AlinaGD, AlinaSL, Amelia, Ballo, Beatrice, Iris, RicamoGD, Sirena, and Verona. Fine durable porcelain is used to create this regal masterpiece. The good thing about porcelain is that they are safe to use during dining and that they are far from harmful substances to contaminate our food. Also, the durability and long lasting feature are on thecheck, and the porcelain material adds more elegance to the dinnerware set. This dinnerware set is composed of eight of each of the following—10 and ½ inch dinner plates, 8 and ½ inch soup bowl, 7 and ½ inch salad/bread and butter dishes, 8-ounce cups, saucers and 5 and ½ inch fruit or dessert bowls. Also included in the set is one 14 inches oval platter, one 9 inch serving bowl, one salt and pepper set, one teapot with lid, one creamer and one sugar bowl with lid. Each piece works perfectly fine, and the dinnerware set is compatible with both microwave and dishwasher use. 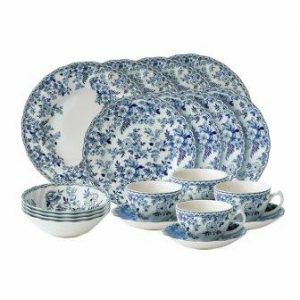 The good for eight service feature of the dinnerware set does not merely end with a complete collection good for eight people—another thing to love about this deal is the additional porcelains added to the package. It is also durable and well made, so there are no problems associated with this product set. The usability of the products is working well in places as advertised. The customers are happy with their purchases. The complements above the eight service set are ahuge advantage for those seeking a good deal. The only issue that customers had claimed about this set is the customer service problems associated with delivery and return procedures. There is something more to improve the system. A cohesive, well coordinate set brought to us by Lorenzo Import, this 57-Piece dinnerware collection provides us with beauty in its raw, simple form. The adorable silver border décor on the plates and utensils are stunning to stare at. Among the others in the list, this is the best set that corresponds to each piece’s design and patterns. They are neatly made, and that’s important if the manufacturer wanted to seek the buyer’s attention and taste. 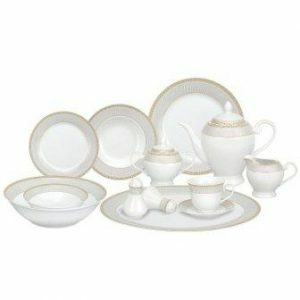 Made from durable fine porcelain, this dinnerware set is created with utmost care and perfection. The material used is delicate yet suited for dining essentials. The pieces might be a bit heavier than the others on the list, but they assure for great quality and durability. This is one of the finest choices of raw, natural material for dining tools as they are safer than other dinnerware materials out on the market. Lorenzo Import’s set of dinnerware is composed of eight of each of the following—10 and ½ inch dinner plate, 8 and ½ inch soup bowls, 7 and ½ salad plate, 5 and ½ inch fruit bowl, and one teacup with a matching saucer. Also included in the list are one 14 inches oval platter, one 9 inch serving bowl, one teapot, one creamer, one sugar bowl, and one salt and pepper set. 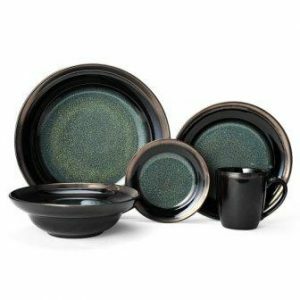 This dinnerware set is another choice if you are searching for a collection that includes other serving piece essentials as a bonus to the eight service set. The primary purpose is undoubtedly met, and the durability aspect is on thecheck. The simple yet majestic set is dishwasher safe, although it is silent about the compatibility of the set for microwave use. The customers are satisfied by the dinnerware set’s quality and durability, as well as the appearance and color design of the pieces. There is no problem in wear and tear as well, and the happy buyers are joyous about the flexibility of the sets to accommodate grand parties as well as simple occasions. The only downside of this Lorenzo Import product is the shipping problems encountered by several customers, as well as the item being not microwave friendly. If you are a fan of the oriental, Asian vibe, then you need to check this dinnerware as soon as possible! The exquisite and expensive looking collection is brought to us by Mikasa—the Jade 40-Piece set which can service up to eight people. The effective combination of the colors black and jade is astonishing to look at. It is satisfying to merely stare at the sturdy, modern yet stylish built of the platters and bowls, matched by the mug that comes with the set. It looks crisp, flawless and pretty, which is a total necessity in your dining setting! Constructed from stoneware, this regal and elegant dinnerware set is created with the best quality of raw materials to cater the customers’ needs while maximizing their satisfaction in terms of looks and appeal of their product. This is truly a masterpiece not only based on the external aspects, as well as the supreme material choice and characteristics. The set includes eight of each of the following— 11-inch dinner plate, 8 and ½ inch salad plate, 6-inch appetizer plate, 8 and ¼ inch diameter (16 ounces) soup cereal bowl and 12-ounce coffee mug. These pieces feature a reactive glaze that makes the jade color pop that makes the set more charming and alluring. The reactive glaze of each piece is handcrafted to create different pieces. There are no two pieces that are exactly alike due to the complex process this set undergoes. The dinnerware set is dishwasher and microwave safe without any problems with appliance use. The unique color variation and patterns will surely spice up your dining setting and collection. The customers are very much happy with the result of their purchase. The package came in good and secure packaging, and the contents are safe from breakage and damage. The pieces are sturdy and durable, that’s why buyers are enjoying their use over more years to come. The dilemma for this dinnerware set so far would be that they might vary a bit in color and that they are a bit heavier than the typical sets you can buy online as well. 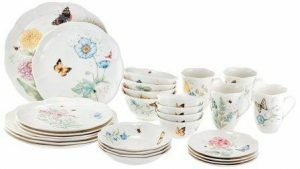 Among the other dinnerware sets in the list, Lenox’s colorful 28-Piece butterfly meadow classic is remarkable and eye-catchingto the customers. This is one of the few on the list that used thevarious play of colors, and the technique is working well! The ceramic pieces look whimsical and gorgeous, and most women will love to purchase this set for the pretty and chic colors painted on the white, neat surface. Isn’t it lovely? Made of chip resistant Lenox white porcelain, the butterfly themed beauty is guaranteed durability, long term of use, and sturdiness due to the strong material used to create each piece from the collection. The flowers and butterflies painted all over each piece also adds to the reasons why you should purchase this home-themed set. The Lenox butterfly themed set is composed of four 11 inch dinner plates, four 9 inch salad plates, four 6 and ¾ inch fruit dishes, four 6 inch party plates, four 12 ounce mugs, four 16 ounce bowls and four 12 ounce dessert bowls. 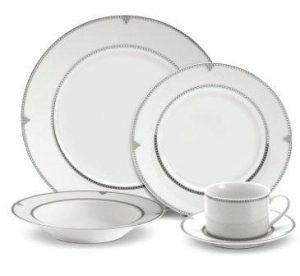 One of the things customers need to know about this dinnerware set is the guaranteed Lenox Lifetime Breakage Replacement Program. Also, the set is capable of microwave and dishwasher use. There is no need to worry about the quality of the product as it is created with the best quality of materials Lenox consistently uses with all of its product lines. The customers have been appreciative of the beauty of the porcelain, as well as their charm in the dining setting and home improvement. The replacement process is also great, and the sizes are perfect. They are also easy to clean and since they are compatible with microwave and dishwasher use, they are easy to care for. The only dilemma for this is that some customers are not a fan of their design and that they believed that the pieces are thin. 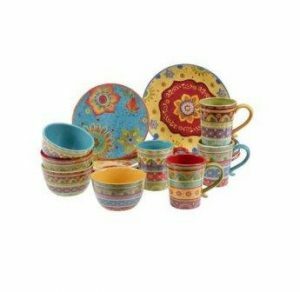 Among the top dinnerware sets everyone should check out, the Tunisian Sunset’s 16-Piece dinnerware set is the brightest with vibrant colors and gleeful prints to capture everyone’s attention. This set does not only please the colorful stuff fanatics, as well as those with different taste and preferences. The play of bold, warm hues speaks as acelebration, and this one may fit all types of gatherings especially reunions and get together parties. Made from 100% ceramics, the 16 pieces included in this package does not only surprise people with the wondrous design of print. The thing customers should love about this is that it is safe from harmful chemicals. These pieces of ceramics have passed all lead and cadmium requirements. This assures safety, purpose,and beauty in one package. The set includes four dinner plates, four dessert plates, four bowls and four mugs. These beautiful and adorable patterns are handmade and designed by Sue Zipkin. The strong and great quality of the pieces ensures for long lasting, durable quality of the dinnerware set. The colorful, vibrant colors on theprint are not identical to another which makes them more special and adorable. They are also perfect to share with family and friends over a sumptuous afternoon lunch especially outdoors. Pretty, colorful, perfect and adorable. These are some of the words the satisfied customers have used to regard their praises and happiness over the colorful masterpiece offered by Tunisian Sunset. The pieces are good sizes and quality. They cannot ask for more about the physical appearance and durability of the plates and complements. The only issue that these pieces have encountered with several customers is that they have tendencies to chip easily. Who says plain and simple plates are boring? Then, Red Vanilla proves them wrong! This staple and neat dinnerware set are an essential for all homes. Aside from Red Vanilla’s supreme quality, durable plates, these ones are perfect for whatever occasion you are planning to share with family and friends. Made from porcelain, this classic contemporary design is created for long-lasting use with zero tolerance for defect and tear. Also, this plates and bowls are easy to care for and clean. The material and construction of each piece are ensured with best quality and precision. The set includes six of each of the following— 11-inch dinner plates, 8 and ½ inch salad plates, 7 and ¾ inch soup bowls. Everything is created with white porcelain material. The care instructions for this dinnerware set is simple and easy. Each of the pieces in the set is adishwasher, microwave,and warm oven safe up to 200 degrees Fahrenheit. There is really nothing special about this set, but the sturdy, rigid and tough construction ensures for long usage and durable quality of the pieces. The customers have loved the off-white plates especially for service and business use. They are praised and loved by loyal buyers for their versatility and good quality. Since they are simple and pure white, the food on the platter is highlighted. The only issue that goes with this set is that the plates could have been better flat and that they are bigger than what other buyers have expected their actual size to be.